We have reached the midpoint of the season so leagues are offering their midterm examinations. Who has excelled and is at the top of the class? Who is in danger of being held back? The tension grows as more questions are being asked. To be honest, I just don’t feel that funny right now. It’s been a long week and I have things on my mind and it just isn’t happening. It happens to everyone as they get older, you know. It’s not like there is a little blue pill for funny – funny doesn’t work like that. Plus, if I did take a little blue funny pill and I could sustain my usual levels of funny for more than 4 hours I would have to call my doctor. I think I need a lie down. I was watching London Wasps play the Saracens and saw this play. I immediately shouted “TRY” and the rest of the bar (yes, the bar had rugby on 3 screens – I love 2015) started to argue but I held firm. This a textbook example of one of the more rarely seen calls. Good to know the referee got it right and I will generously concede that he would have got it right even without a TMO. For your reference, Law 22.5 (g): “If an attacking player is in touch or in touch-in-goal, the player can score a try by grounding the ball in the opponents’ in-goal provided the player is not carrying the ball”. This is starting to get a little embarrassing. We have a reputation to uphold. For the past THREE weeks we here at Hail Pelicus extolled the virtues of the Northern California Referee Exchange program and how travelling to other unions and even countries to referee rugby is one of the great advantages of being part of this society. So for nobody has raised a wing to host our far-flung future friend. Alliteration aside, this is an opportunity not to be missed as I have great friends whom I have met while both hosting and being hosted. Time to look deep inside, make a few concessions with the SO and open up your home to incoming Virginia referee Patrick Benner, who will be here on March 28 and will partake in the tournament at Napa. We do not want to sully the immaculate reputation of Northern California as the best destination in the USA. If interested contact Bjorn Stumer at bstumer@att.net. Well Rocky, that’s simple. If you send a selection of photographs to Our Scott Wood at rscottwood@gmail.com then he can add a photo to your details. Please note that, similar to Pelicus Names, if there is a highly inappropriate photo available on social media then he may elect to use that one and you will have no say in the matter. FYI, NorCal Collegiate Rugby Conference (NorCal CRC aka NorCal small colleges) does us a Blowout Substitution Flexibility rule (BSF), which should always be explained to the referee well before the match. In one case, the referee did not agree so we did not use. The rule is as follows: if a team is up by 28+ points, neither team is restricted by the 23-man match roster listed before kickoff. Instead, teams may substitute “freely” from their team as long as all other rules comply (e.g. no playing subbing off only to be subbed back on unless specifically a front row player for safety reasons, etc.). If the winning team’s lead starts to fade b/c it took off its star players, c’est la guerre. They must soldier on without bringing those stars back in to “save the day”. The intent is to allow less experienced players from the dominating team to get involved while at the same time leveling the playing field and making it more competitive for the losing team. The winning team gets to play players it wouldn’t normally list and the losing team subsequently faces a weaker team, a much more satisfying condition for everyone. Is it perfect? No, but NorCal CRC would rather see game scores of 55-25 than 75-5. Could it play havoc with standings and bonus point systems? Theoretically, but it really hasn’t yet. I was inspired by the Positive Coaching Alliance to suggest the BSF rule. I’ve also heard that high school rugby does something similarly, but not sure it’s true. A well contested match between two quality sides. CMU’s superior discipline, game plan, and home field advantage in the form of swarms of giant (no exaggeration) mosquitos proved too much for a Sonoma State side that competed to the final whistle. And Bruce is of course right-which style are they playing? Here it was a very fast and wide open 15s. It was also vastly good spirited and fun. EDITOR’S NOTE: You ref 10s, of course. Friendly game over at the beautiful Cal Maritime field. The All Blues were the more skilled and well trained team, but Life West had great aggression and passion. The game started off with a try by the All Blues about 5 minutes in off a quick tap penalty. 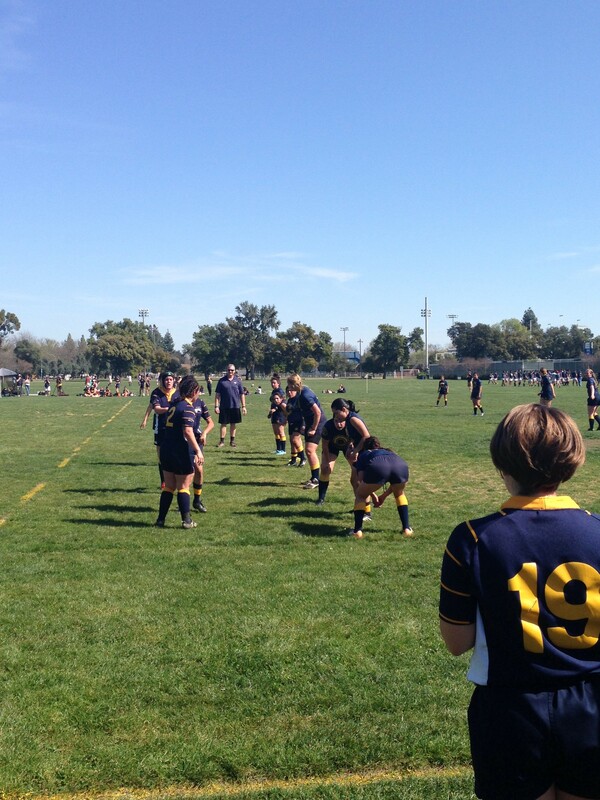 They scored again off of a scrum after the ball was held up, and once more in the half for a halftime score of 15-0. Life West is a new team and had players who were keen to get the ball, but tried to do it from the bottom or back side of a ruck. They scored a breakaway try in the middle of the second half for their only points of the game. But they had some excellent goal-line stands and solid defense all game. The All Blues kept up their speed and support, managing a ton of nice offloads throughout the second half. They scored 3 times in the second half. Overall, a fun game for all sides. I was greeted with a beautiful day in Chico, with what seemed half the city in attendance to support the home team. Purportedly this rivalry has become intense over the last few years. It certainly showed in players on both sides as the action was fierce from the get go. Both teams are well coached and the players verbalized changes in gameplan throughout the match according to conditions. A little “cat and mouse” occurred whereby Chico St. would not commit to a maul on Stanford’s line outs and Stanford would keep the ball with the line out jumper, in front, so no obstruction would occur. Stanford started strong with two tries and most of the possession in the first half. Chico St. had numerous unforced errors and was on the back foot. 14-12 Stanford at half. Chico St. made an adjustment for the second half and peeled off two tries in the first 4 minutes courtesy of JW, the big outside center, who put the team on his back, made two gaps and simply outran the defense for long tries. Chico St. had the preponderance of possession, but two ill advised backs passes were picked off and returned for converted tries by Stanford’s wing and one could feel the momentum shift back to Stanford. 36-28 Chico St. after a short penalty kick and a forwards led try. Chico St. ran a nice pick and drive multiple phase attack at the death resulting in a try for their lock. A sloppy game by both teams – frequent miscues at the breakdowns, knock-ons, etc. Even yellow cards didn’t help slow down the repeated infringements. Great kicking at goal kept Chico in the game. Chico had opportunities to score a winning try only to be undone by a forward passes and knock-ons. Pitch looks like an English pitch. Grass is firm and lovely. Full sized, lined, flagged. Next to a parking lot the size of a small airfield that you can’t park in. And the parking lot you can park in, you need to first, see the signs that say you need to by a permit, and then find the machine that will sell you a permit. Neither of which I did, $45 parking ticket. CSUMB is a new team. UCSC is not. The point differential tells all. But the MB ladies tried hard and seemed to enjoy the day. After the game one of them said “You reffed one of my games in High School.” This sort of thing is happening more often now. The UCSC #12, Rachelle Tanase. was amazing. Not only was she able to slot conversion kicks, she scored tries, directed traffic and was all over the field. She also choose a re-kick at least four times when a MB restart kick didn’t go ten meters. Have never seen that before. So to recap the game, incredible pitch, blue skies and cool breeze, and two teams that liked to play rugby. Very nice day. Match could have gone either way starting 24-21 (3 tries apiece) in favor off the Gaels. Each team had a back with a hat trick, Grant the fullback for the Gaels & the Mighty Oaks outside center. Both teams then scored two more converted tries in the 2nd half as both kickers were also on fire (10 tries total). The difference was 4 penalty kicks Chico surrendered mostly as time was running out. Party at the Port Costa Warehouse was awesome & dinner across street at the Bull Valley Restaurant was even better. Tight in the beginning stages, especially after a yellow card to Razorbacks #6 for high tackle at minute 4, but Razorbacks won handily in the end as Bulldogs tired in the second half and fatigue and needless penalties by Bulldogs allowed Razorbacks to pull away in front of good-size crowd for the EPA derby. The Aptos Beachdogs traveled to Turlock to play the Modesto Harlots, delayed a little by an accident which pushed back kick off by 15 minutes. Both teams went back and forth in the first quarter before Modesto claimed the first two scores after a quarter of the match for a 14-0 lead. 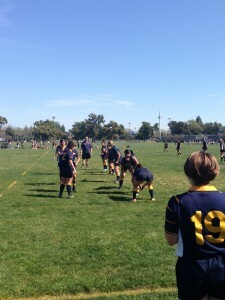 Aptos claimed a try back and the half ended at 14-5. Modesto started the second half strongly with good off-loading and vision from their more experienced players building a 28-5 lead. They should have gone further ahead but a clean break around a ruck which should have been a score but was knocked on in-goal, a mistake that would haunt the home side. As Modesto’s older legs tired, Aptos stayed with their game plan and were able to add two scores of their own, cutting the lead to 28 – 17. Another score reduced the margin to 28 – 24. With their confidence back, Aptos maintained the pressure and Modesto struggled to respond. Aptos then worked another score to take a 31 – 28 lead, leaving their tails up and confidence strong. As Modesto tried to build an attack to reagin the lead, a telegraphed pass was intercepted an 45m later Aptos were ahead 38 – 28. Modesto were able to build for a final score but ran out of time and Aptos won 38 – 32. Warm, sunny day, again. Napa has some big boys. They took the lead, scoring 4 converted tries by the half and were up 28-12. Mendo made a game of it in the second half, with the score 40-24 for quite a while. Napa scored to more converted tries in the last 2 minutes of the game to pad the score. Final score was 54-24. For a friendly game, this was well contested and there was strong play from all sides. Olympic club opened up the scoring, but Stanford GSB came right back with a stolen pass for the try. In the first half, OC scored twice more, while Stanford got a penalty kick. The second half showed off the speed and fitness of Olympic Club, with a few more tries, but Stanford kept up their pressure, and even scored in the final minute of the game. Good times over at Treasure Island. Thanks to Mike King for watching. Tied at 29 with 8 minutes to go, so not really decided to the end. O Club are becoming quite the second half team although they need to add a first half to that. They do have one of the best scrummaging tight-fives in the country and set a lot of their platform from there. Belmont Shore tore the opposition apart with Mike Teo starting at full-back and then shifting to fly-half and Sinapati Uiagalelei on the right wing being pretty impossible to stop. Nice game overall and some great rugby on show. Good to see that games at the bottom of the table are still high in quality. Hot day, allowed two extra minus at half for hydration. Sierra Coach didn’t have paperwork so nothing to sign. Someone else with the club does that task and he didn’t before going out of town. The second half was a slug fest and seesaw battle. Each team had opportunities to score with long runs, breaks and great support play. While the Lions were down to 14 men due to dangerous play, SFGG was able to dot down a converted try and take the lead. Just like the first half, each team pushed close to the try line coming away empty. The Lions were able to create a fast break which resulted in a converted try in the 36th minute taking the lead back by just 2 points. The game wasn’t in the bag for the Lions until the final whistle blew. Final score: Sac Lions 29 – SFGG 27. Sac State had control of the match from the opening kickoff. More physical, faster and more skilled, they imposed their will upon the visitors from San Francisco. Their forwards overpowered the BATS and CSUS had ball possession, which led to field position, which led to tries – for the first forty minutes, which resulted in a bruising 40-5 score in favor of the hosts at halftime. The plucky BATS who played all day with only 15 bodies and no subs never shied away from contact, and made the second half much more competitive (22-10 Sac State) for a final tally of 62-15 as the Hornets closed out their home slate and CSUS seniors went out with a home win. Another 10’s game that had 15 minutes halves. Neil coached me this game. Fresno had 4 tries with one conversion (and it was an ugly drop that just looped over the bar). The Seahawks squandered opportunities. I have reffed the Santa Clara women’s team a few times recently and know that they have a strong team, so when you look at 76-10 as your final score know that is because UN Reno has a VERY GOOD team. They have talent all over the field with sure fire All American at center, one of the best collegiate kickers around and can play you hard up front or fast outside. This a COMPLETE team. Assuming they don’t have a total exodus of players, this is a team that should be competing at the next level. It was a comprehensive performance using every player at their disposal and a well earned victory. Look for them to go deep in the playoffs. This match was played with a fun spirited attitude and commradiere. Sierra struck first and often in taking a 30 – 12 lead into the second half where they continued their dominance. The Fog gave it a good try but were no match with the game played on their half the most of the game. Sierra did away with the hamburgers and provided all with a pork bbq and beverages to quench the thirst on a hot day in Lincoln at Joiner Park. It’s always a tough day when SVR plays SVR. Going into the match I anticipated SVR coming on top. But what a back and forth match. It was exciting from start to finish. The match started off with southern sprinting out to a quick 15 – 0 lead. Based on those first twenty minutes you would have thought southern was going to take this match easily. Not so fast said silicon. They were able to capitalize on a few mistakes and some hard running to pull this match even at half time. It was 15 a piece under the blistering San Juan Bautista sun. The second half was brutal. It was hot. Everyone was tired. And the match pounded on. Scores were answered with scores. It was neck a neck. The difference was the kicking game. While each team was only able to complete a single conversion, but southern chose to go for two penalty kicks in the second half. Silicon had their own chance to take a penalty kick, wanted but changed their mind and kicked for touch. With under ten minutes to go in the match southern was leading by a single point. The match ended with southern still up by that single heart breaking point. Saint Mary’s fought well and never gave up, but was never in a position to score points. Humboldt scored 15 tries. Pelicanland produced another postcard last Saturday as I added to my windshield’s collection of Central California’s low-flying insects on my way to Davis. Rolling onto campus at 12:00 with a sizable crowd already cheering on the women’s match I paused to take in the atmosphere of college rugby on a (nearly) spring day. Life doesn’t get much better than that. One of the reasons I took up the whistle after laying down the boots was to stay involved in rugby and one of the great side benefits is that you stay connected with the community. Just about every week I run into an old friend, coach, teammate or opponent and chat about life, the universe and everything (42). Often this requires beer, but not always. This week I had the privilege or running into Steve Gray, who I first met while enjoying my cup of coffee at the USA 7s Eagle Camp. He always seemed like he was fitter than me then – and I was pretty damn fit then – but now I’m not going to bother asking the question. Both teams were ready to go and, if possible, more prepared than your humble correspondent. I brought a set of radios and offered one to each coach so they can listen to me as I talk to the players. The Sac St coaches looked confused and wondered how to incorporate this as they already had radios that they would use to communicate amongst themselves. This is not your grandpappy’s rugby. The game started bright and fast with both sides running hard and tackling with abandon. To be fair, there really isn’t much to write about. UC Davis had an advantage with size and speed and used it to score points, but Sac St was just as determined and tenacious but didn’t have the finishing edge. I think I talked to the captains twice; once to both captains to explain why there had been no off side penalties so far (both teams were disciplined and both teams rarely committed to a ruck, thus no off side line) and once to Davis for a not 10 penalty. That’s it. It was the cleanest, hardest, most fun game I have refereed in longer than I can remember. It was a joy to be a part of, really. Even as the score tilted away from Sac St they played hard, clean, disciplined rugby and were rewarded with a well deserved try late in the game. Both captains were gracious after the game and should be proud of their teams. Life looks to be the cream of the crop in Division 2 moving into the playoffs. This week Life worked incredibly hard to change the culture of the club on the pitch. The captain did a phenomenal job of managing his players so the referee didn’t have to. At one point in the game a player was told to release the ball at tackle, mind you only one time, by the referee, and the captain reiterated what was asked. Pleasure to referee the game. The teams arrived at Danny Nunn Park, Fresno in a charter bus and Humboldt in team vans after their two game set at St. Mary’s the day before. Humboldt scored on the their first possession within the first minute and then again every three minutes for an 88 – 0 halftime advantage. The second half provided Humboldt with 6 additional trys and a conversion for an agreed upon shorter half. Danny Nunn park is in terrible condition, hard ground and large patches of dirt, lack of mowing what grass is there, made it difficult to see any of the lines. The flags were the guideposts and the home team had to supply them! We can do better than this! A coach for UC Davis Women took charge of a scrimmage against Cal and has mastered the first rule of refereeing: When both teams are wearing the same color, you should wear that color as well. This entry was posted in News on March 12, 2015 by James Hinkin.